Macaroni and cheese is the ultimate comfort food. The creamy, gooeyness of this dish and comforting taste makes it a favorite for lots of people. Finding a great mac and cheese recipe lets you whip up this amazing dish whenever you want. Another great thing about mac and cheese is that there are so many ways to play with the classic recipe. For our version, we’ve added ham to go with the macaroni and cheese. 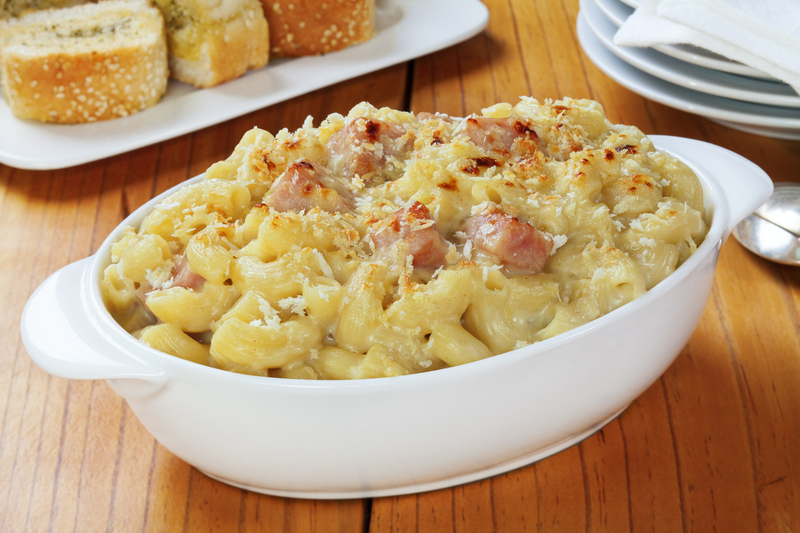 The heartiness and smoky flavor of the ham give the mac and cheese a little something extra. Whether you are bringing a dish to a potluck or want a tasty meal to chow down on after a tiring day, macaroni and cheese is a perfect choice. It is a favorite for many people, ensuring you’ll bring an empty dish home from the potluck. It’s also likely to perk you up after a frustrating or seemingly never-ending day. Let the cheese melt in your mouth as you catch up with your family, or curl up with a bowl on the couch. To learn how to make mac and cheese with ham, follow our simple recipe below! Cook your macaroni according to the directions on the packaging. The macaroni should be done al dente. Spray a 9-inch round deep dish pie dish with cooking spray. When the macaroni is done, drain it, and then pour it back into the pot. In a large bowl, whisk together the eggs and milk until evenly combined. Add the Bisquick and whisk until smooth. Stir in the cheeses, baked ham, salt, and black pepper. If desired, save a little bit of each type of cheese to sprinkle on the top. Add the cooked macaroni to the cheese mixture. Stir until the macaroni is evenly coated in the cheese mixture. Gently pour the mixture into the pie dish. Bake the macaroni and cheese for about 40 to 45 minutes, or until a knife inserted in the center comes out clean. When it’s finished baking, let it stand for about 10 minutes. Garnish with parsley, cut into wedges and serve. When you’ve found a great recipe, you can make it even better by using the best ingredients that you can find. Using Sauder’s eggs, you can make our mac and cheese with ham recipe truly amazing. We are dedicated to providing the best quality and freshness in our eggs. To make our mission a reality, we partner with local farmers who agree with this idea. To find Sauder’s eggs at your nearest grocer, please use our store locator today!